A popular series on this blog, The Founder Chronicles, tells the gut-wrenching ordeal we went through when our horse, Bonnie, foundered. She scared us in November when she did it again. I am happy to report that Bonnie is already almost well. Mostly, she is not allowed to graze much, and she eats low-carb food. Thankfully, founder (laminitis) research has come up with some great new approaches. TheHorse.com put together a report on this fall’s fifth International Conference on Laminitis and Diseases of the Foot. Read these stories now, so you'll know how to avoid founder and what to do if it strikes. The blood tests came in: Bonnie was insulin resistant, a short way of saying her body was sensitive to carbohydrates, especially fructose, much like a person with diabetes. After a friend suggested reading the Keith Seeley web site (http://www.keithseeley.com/), I realized Bonnie had additional risk factors. Our veterinarian heard that other owners with insulin resistant horses were getting good results with a supplement called Quiessence , which I ordered (http://www.foxdenequine.com/quies.htm). We worried that prolonged exposure to phenylbutazone (bute) would begin to cause ulcers or kidney distress. On the recommendation of another friend, I ordered Hilton Herbs Phytoflex (rich in devils claw, willow) to ease pain and replace the bute. Hilton has since discontinued its willow products, but there are other “herbal bute” suppliers out there. We still fed Bonnie grass hay only. Note: We only use irrigated grass hay. Theoretically irrigated grass is less stressed than dry land hay and will carry less fructose. (See SaferGrass.org.) We also started Bonnie on a complete feed called Triple Crown Lite (http://www.triplecrownfeed.com/litefeeding.php). The styrofoam/duct tape booties were a hit. Bonnie loved the extra cushion. However, the booties only lasted three days at best, attracted dirt and gravel, were hot to wear, and took a lot of time to make. Today, there are many better options. Then, we needed a full time horse nurse who could also make booties … or we needed a different solution. When you cannot exercise, losing weight is a challenge. Unless we could reduce the known mechanical causes of Bonnie’s founder, get her to exercise, and keep her circulation going, we would be fighting a losing battle. She would waste away, or worse, fatten up just standing around in her stall, gaining weight even on a starvation diet. Our veterinarian ordered short 10-minute hand walking on a soft, deeply plowed surface. I whipped out our John Deere 950n and tore up Pooh Lane, our spreading-composting zone. But Bonnie hated even leaving the soft sand of the stall to trek down the firmer barn aisle to get to Pooh Lane. She would pull on the lead shank like the proverbial mule and refuse to budge. We had attended the weekend horse show with other mounts, and friends stopped by our horse trailer with words of sympathy. One horse show mom suggested that we make slippers for Bonnie out of construction Styrofoam and duct tape. All we had to do was trace Bonnie’s feet, plus about a one- inch margin on the Styrofoam, cut the shape with a knife, and use duct tape for the boot. It sounded weird, but the horse show mom insisted this had worked for her old Arabian gelding. We left the show early to go to our local home construction store for supplies. A few days later, the veterinarian took radiographs of Bonnie’s feet. Bonnie’s coffin bone had moved one to two degrees, but she showed no sensitivity to hoof testers. The situation could have been worse. Our farrier removed Bonnie’s shoes and said he had worked on horses with much more coffin bone movement than Bonnie’s, horses with truly dire outlooks, and those horses had beat the odds. We were puzzled about what caused the attack. Bonnie was not exposed to any of the storybook causes of laminitis: a long time on fresh, green grass or a sudden influx of grain. However, Bonnie was overweight and had developed a heavy crest. Our veterinarian guessed Bonnie could be pre-Cushings (tumor on the pituitary; common in older horses; not life threatening), which would make it easier for a horse to founder. Bonnie had always been sensitive. You could hardly use the rubber curry comb on her. This foot pain was killing her, possibly literally, according the veterinarian. The anxiety caused by pain can affect a horse’s metabolism and make laminitis worse. It was critical that we break the vicious pain cycle. We put Bonnie on Banamine twice a day and the sedative Acepromazine every eight hours. 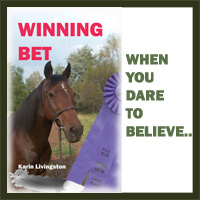 I canceled Bonnie’s Reining entry at our saddle club’s upcoming Saturday horse show.